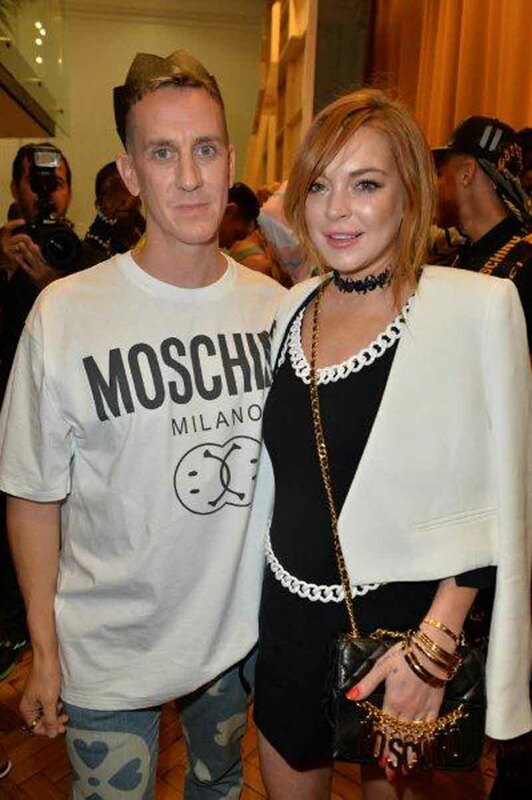 LONDON, Jun 17, 2014/ — With Lindsay Lohan, Daisy Lowe, Mary Charteris, Robbie Furze, Pixie Lott, Labrinth and Staz Lindes sitting front row, Jeremy Scott unveiled the Moschino Uomo Spring/Summer 2015 collection in London. With logomania, smiley faces, pop prints and rugby stripes Moschino’s signature tongue-in-cheek approach to fashion meets the trademarked Jeremy Scott crazy fashion. In a visual explosion of bright colors and fun motifs, the upcoming sunny season represents a new take on the maison’s iconographic themes, making way for a stylish yet ultra-versatile wardrobe which ranges from luxury sportswear to twisted takes on the tuxedo. Giant Moschino symbols featuring house icons of hearts, cowboy hats, and the letter “M” come together to form a maxi monogram appearing in faded denim, technical fabrics and intarsia knitwear. Even Moschino itself is not safe from Jeremy Scott’s wicked sense of humor as he sent an irreverent take on the Moschino logo, “FAUXSCHINO”, embodied all over MA1 bombers, parkas, and the classic tracksuit to a bold effect. Branding and consumerism take form in the inspiration of soda pop graphics, from lemon lime and grape sodas, to the classic cola colour ways urging you to “DRINK MOSCHINO”. The collection is a vibrant tribute to modern street and pop culture, but a luxurious feel still remains in the shape of leather bomber jackets with polished metallic locks and zippers, or crocodile versions adorned with gold plaques.